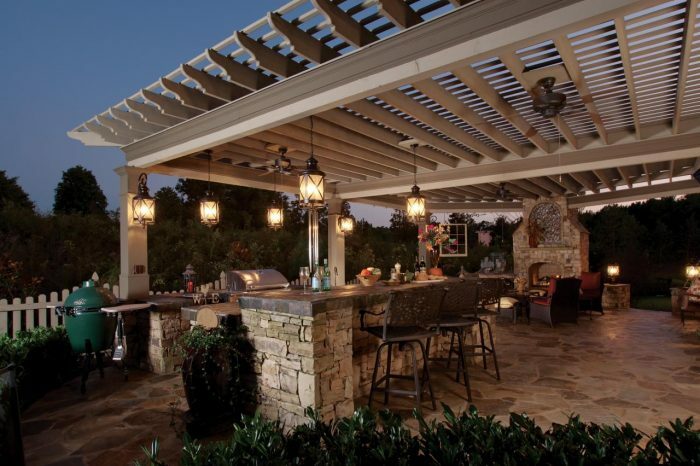 When it comes to patio lights, it’s important to choose quality outdoor patio lights and follow good installation tips. Read our guide! Nothing says “warm summer evenings” like sitting in the garden surrounded by the pearly glow of patio lighting. It is something often seen in movies and thought of as a gimmick reserved for the rich and famous in their mansions. It is, however, surprisingly easy to install patio lights in your garden or on your patio once you have worked out exactly the effect you want to achieve and looked at your budget. Do you want to have enough lighting to read or entertain by or just to create a background of soft ambience? Do you want light to illuminate a walkway or a light attached to a wall or convenient tree? These are just some of the ideas we will discuss in this short article. The simplest and cheapest to buy are the strings of fairy lights with LED bulbs. They don’t provide much illumination but are more in demand as a decorative accessory. They are very cheap to buy but can cost a lot if you have to keep on replacing batteries all through the summer. These are definitely temporary and probably will not last more than a year of exposure. LED strings are best draped across shrubs or along fences or from tree branches. Solar powered technology is becoming more efficient all the time and there are plenty of solar powered lights for sale at reasonable prices. Solar lights can be bought in strings with one solar panel or as an individual light with its own panel. 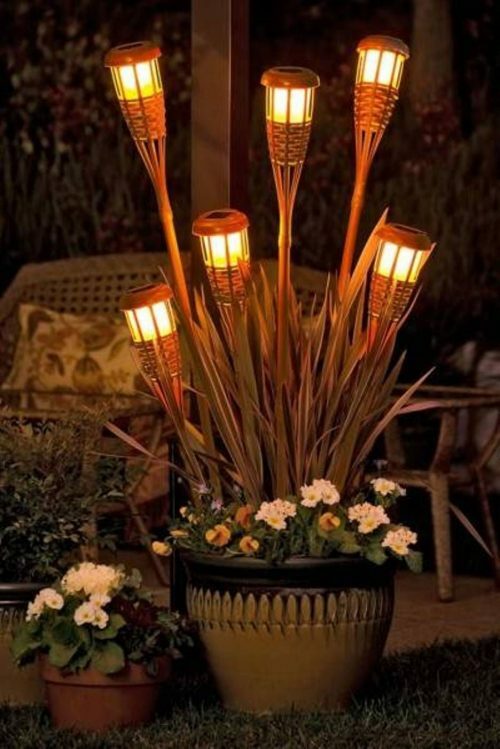 These are especially useful as illumination along a walkway or to provide a warm glow in selected areas of the garden. The amount of light produced by these lamps is not really strong enough to read by but is quite adequate for entertaining and providing a warm background glow. Although these do not require any special installation they can be placed in the garden permanently and as long as the panel is kept clean will continue to produce light for many years. They have the added advantage that they are able to be lifted and rearranged if you become bored with them in a specific position or if your garden design changes. These are outdoor lights wired together and use 12V electricity supplied from a transformer plugged into the mains supply. These are perfectly safe for the amateur to fit and provide a good light. These are the most permanent and the most expensive to buy and to install as they will require fitting by a qualified electrician who will not only install the lights but also the cable from your household electrical distribution board together with the required circuit breakers needed for outdoor electricity. These lights are the most versatile as you can use them for decoration and as purely utilitarian lighting. They will always give the brightest illumination. Once you have decided on which type of lighting you are going to use, it is then time to play with ideas for the locations. There is no right or wrong way to decorate your patio with lights. Whatever works for you and produces a pleasing effect is the correct way to do it. If you still want some ideas then maybe I can give you some starting points from which I can hopefully give the initial push to make something pleasing for your garden. Posts or low wall around the patio area. This marks off the boundary of the patio area and encloses the warm and comfortable living space. Handy tree branches. If you have any trees or branches or a fence running near the patio perhaps you can illuminate these and bring them into the warm space. Sculptures and architectural features. Have you any garden sculptures or fountains that can be used? How about a pond that will accept underwater lights? Maybe the overhanging eaves of a veranda can be incorporated. Backgrounds. Draping lights across sturdy plants or across a wall will add a subtle background to your entertainment area. Fill see-through containers or buckets with strings of LEDs to produce pretty lanterns. Flower beds. Dense sturdy plants in a low lying flower bed look gorgeous if string lights are half buried within the foliage. Eating area. If you have a dining table set up under an overhanging tree, pagoda, pergola or roof structure, try hanging strings of lights down to illuminate the eating area. This method can also be used around the perimeter of a fire pit. Pool. We suggested earlier about using a garden pond. What about taking the idea one step further and draping the lights over a small swimming pool? Rope lighting. Running rope lighting along flower borders, footpaths or the perimeter of your garden will produce a soft glow to your garden. Lamp poles. If your patio hasn’t got any convenient places from which to hang lights, you can try to make your own by pushing lengths of timber or broom handles into the ground or cement them into large pots. Add some hooks to the top ends and you have instant light poles. There are many different types of lighting fixtures available and we have already touched on string lights and rope lights. All the different types are specifically designed for various purposes and we will discuss them now. These are typically installed so the top edge is flush with the ground. Can be dug into lawns or ground covering plants or mulches. This type takes a lot of installation time as each light is fitted inside a protective underground metal cylinder. Use these where you have trees, sculptures or some other focal point. As the tree grows and matures you will want to adjust the position of the light so choose a light that is adjustable. These are used to illuminate taller trees and the sides of buildings. Floodlights may be used to provide the required illumination. When these small high intensity lights are fitted on high positions looking down, they can illuminate places beneath. These are often called ‘mushrooms’ and are freestanding single lights. They are typically used to safely illuminate walkways and areas around pools. This type is fitted to house and garage walls and is mainly used for security or subtle illumination. These can be used with lampshades and sconces and are often incorporated with motion sensors. The cost of a typical lighting system will vary with size and type of fittings. However if we specify a standard 20 bulb low voltage system using LEDs the costs will be as follows. For a typical front garden system the following costs will be indicative. If you are thinking of installing mains voltage lights you will have to use a qualified electrician to do the work. Most outside lights are low voltage however, and will be perfectly safe for a beginner to install. Bear in mind the following points and don’t forget to follow the instructions supplied with the lighting kit. Underground wiring installed after planting. If you decide to install low voltage wiring, remember that the transformer must be stored away from the weather and the wiring must be installed after all planting has taken place. Otherwise you might find that you will cut through the wire with a spade or shovel. Bury low voltage wire deep enough. Always bury low voltage wire at least 6 inches below ground level. This will keep it out of the way of fingers when weeding and away from pets and other animals such as birds who like to scratch and peck in the soil. Retrofit bulbs. If you already have outdoor low voltage lighting installed, the chances are that the bulbs are halogen. If you want to change to more energy efficient LED bulbs, there is no need to remove and change the old halogen fixtures, just remove the halogens and retrofit with the correct equivalent wattage LEDs. Don’t overlap light. The purpose of outside light is to either provide ambience or to provide safe illumination. If you want ambience then do not over illuminate by overlapping pools of light on decks and patios. You can however overlap on stairs and walkways where safety is paramount. Use indirect lighting. 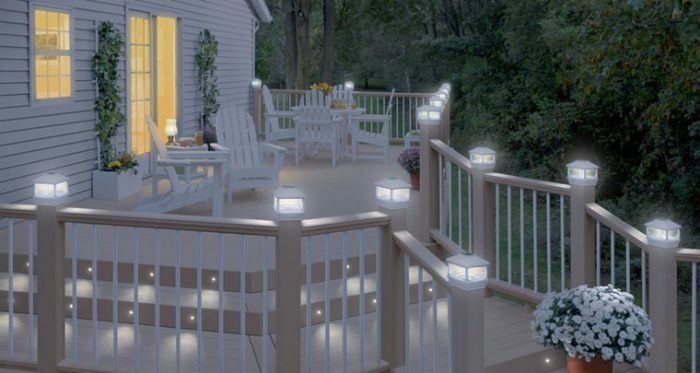 Don’t focus lights directly onto a patio or deck, instead use the lights to illuminate features. This will create a softer light, interesting shadows and will eliminate glare. Use kits. If you just want a small basic system, buy a kit from home décor and garden centres rather than trying to design and buy the individual components separately. Plan ahead. Before you decide to buy anything, draw a plan of your patio or deck on a large piece of graph paper including all the large plants, trees and architectural features. Then buy a clamp light with a metal reflector shade and a range of different types of lightbulbs. Wait until dusk and try out the different types of bulbs in different locations to get the best effect. Mark on your plan the best bulb for each location. Don’t forget to include steps and pathways for safety. An extra transformer. If you decide to add extra bulbs to your lighting system, you can still use your old transformer as long as there is enough wattage to spare. If there isn’t then you can buy a second transformer or upgrade your original one. Stagger your lights. When you place your lights, do not position them perfectly parallel, stagger them and put them at different heights if possible. This will prevent your patio from looking like an airport runway! Protect wire under walkways. Place your wire under walkways rather than across them otherwise someone will eventually trip and fall. A simple way to push a wire under a walkway is to dig a small trench either side. Push a piece of metal conduit or copper pipe, using a sledgehammer if necessary, under the walkway and feed the wire through the conduit. With more emphasis being on interior lighting, and decorating the interior of our homes, gardens, walkways, and patios tend to be neglected. Even when we focus on garden improvement, we often forget the lighting or is something left at the bottom of the patio design list. However, with the onset of spring, we start spending more evening outdoors and sorry to say we miss on the beauty of things that we would only see during the day. Therefore, installing patio lights brings the entire patio together. Finally, you will create an enchanting space that is perfect for dinners and to spend happy moments with loved ones under the stars. These lights are available in various designs and styles. However, what you choose depends on your tastes and preferences and the look of your patio space. One design that caught our attention is the string lights/globe lights. String lights – Also known as party lights, these are bulbs attached to one cable wire which is then hung from a gazebo, attached to walls, eaves or tree branches. Also, you can attach to two poles in buckets of sand. If you want to make the garden table the focal point, wrap them around your gazebo. Pendant shades – Another overhanging light ideas, these are meant for homeowners who are looking for a more contemporary lighting idea. Again the design will depend on the homeowner and expect the prices to vary significantly. Also, if you have a gazebo, it can support the shades, and the garden table will act as the focal point. In conclusion, you can choose between modern and artistic designs. The arty styles will give your garden an eye-catching quirky look. Lantern style lights – If you are looking for retro patio lighting ideas, you can check the old-school lantern lights. Though it would be in the form of an overhanging structure, there are several designs you can choose and give it a spin. We liked the overhanging set of candles as it beautifully unique, and you don’t have to worry about changing the bulbs. It’s also affordable as you don’t have to worry about wiring the patio. If you are concerned about the power bills, or you are an advocate for environmentally friendly lighting solutions, then the solar patio lights are for you. They harness the power of sunlight and light up your space without consuming any more power. They will, therefore, save you a lot of money in the long run as you don’t have to pay for anything other than the initial investment and maintenance. Color changing lights – If you want to host a party and are looking to light everyone’s’ night, then these color changing lights are for you. These not only add color to your outdoor space but are also environmentally friendly as they are solar powered. First, stake the panel into the ground to harness the sunlight, and hang the globes on the gazebo, fence, railing, or tree branches. Any surface can do since the string blends with any décor. Finally, the plastic globes have an eye-catching crackle design and change color every 4 seconds. These lights are the ideal solution if you desire a color fest. Solar walkway lights – If you want to light up your driveway without incurring huge electricity bills, then we advise you install the walkway lights. Each is fitted with a panel to harness power. However, you can use one panel and connect all the lights to it. Finally, they will conserve light as they glow softly on standby and will only light up when a person or vehicle passes as they are motion activated. 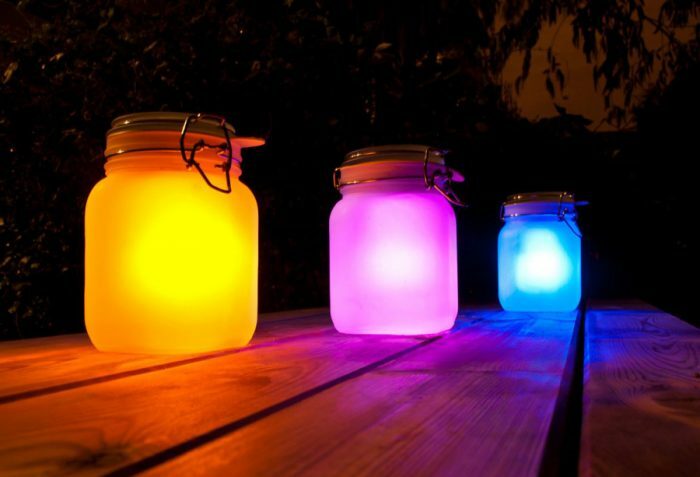 Sun jars – Also known as solar lanterns, these are perfect if you are looking to DIY, or you are interested in portable lights. They are brightly colored and will give you 6 hours of light for a full day charge. If you want to DIY, look for solar mason jar lid inserts, and glue them to the inside of a jar. You can also add color by tinting. Simply add nine teaspoons of food color and one teaspoon of water to one tablespoon of any quality glue. Mix, coat the inside of the jar, and bake for one hour at 93® Celsius. 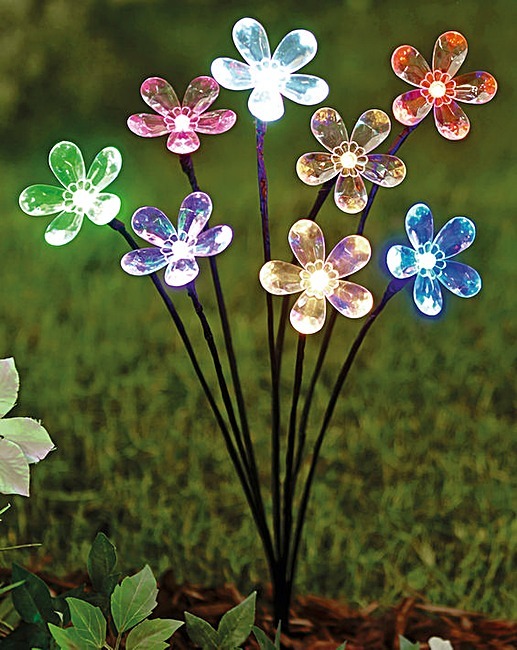 Marquee flower solar garden light – If you are looking for something special, then we suggest these flower lights. Also, if you love flowers but don’t want to dirty yourself playing with the soil, these will be a nice addition. First, they are low maintenance and will live from season to season. However, they will not only beautify your patio but light it up as well. Solar post cap lights – These lights will add a touch to your outdoor design. They are sleek and simple and can be customized to match your décor. Also, you will save money as they are energy-efficient. They will give you 8 hours or more of light for a full day charge. 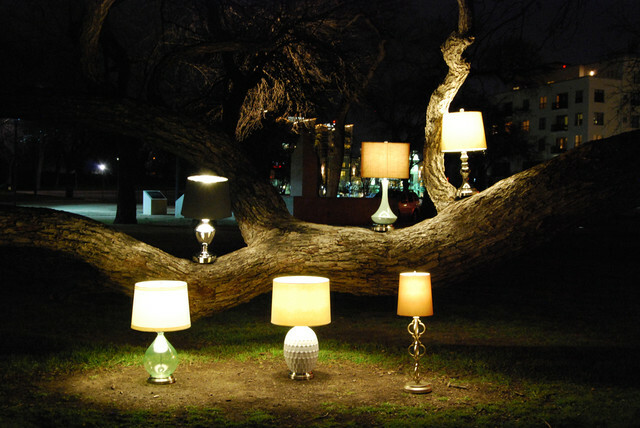 These are perfect to light your patio as there are bulky cords or wires needed. Solar lighted umbrellas – If you want to entertain guests outside, or you love the outdoors, but the weather isn’t conducive, consider using solar lighted umbrellas. These will give you 8 or more hours of light while protecting you from the elements. 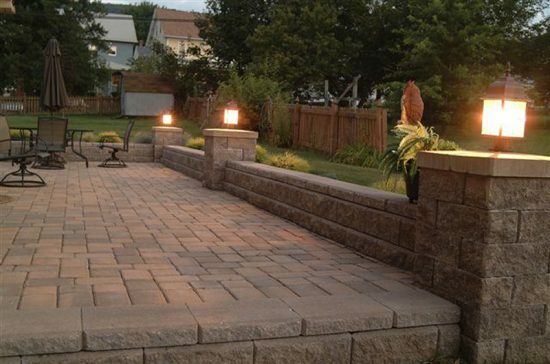 Patio wall lighting is a popular method and one that’s environmentally friendly. The lights are either embedded in the wall or fixed on top or attached to the walls. Also, there are lights that are fixed in the patio ground. If you want to light your space in a different way, look into these ground lights. 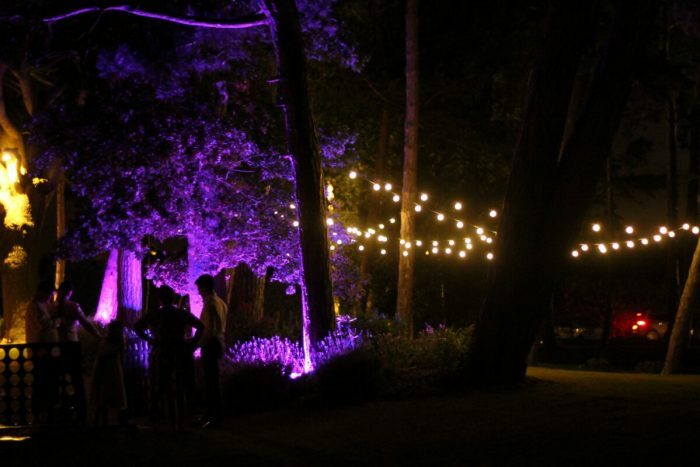 Mood lighting – There is definitely room for mood lighting in your garden. Following the “less is more” principle, these create a chic and refined atmosphere. The lights are attached to walls but the bulbs are directed downwards. The singular light cast towards the ground leaves the rest of the wall in the dark. The contrast and the outcome are amazing. Fluorescent lights – The vibrancy of fluorescent lights is underrated, which makes them perfect. They are funky, unique, and bring a fresh look to patio lighting. There are two designs available. You can select the long purple lights owing to the unconventional look, or the beating red of the outside wall lights. Classic lamps – Finally, you can use the traditional patio wall lights. 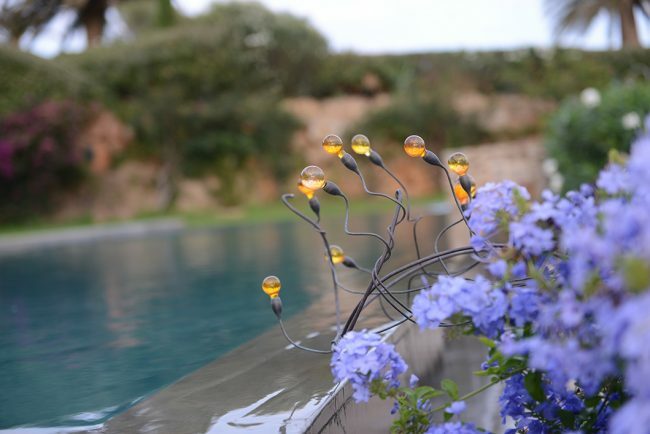 They are perfect in any setting especially minimal gardens owing to their simplicity. Also, they blend well with any décor. These fixtures are attached to the walls with the lamps jutting out lightly and shining their light over the patio. If you are looking to kill two birds with one stone, we advise you get yourself a fire pit. It not only lights your patio but provides warmth which makes it the best addition for people in cold regions. The crackling sound of fire is also a welcome addition and brings people closer. 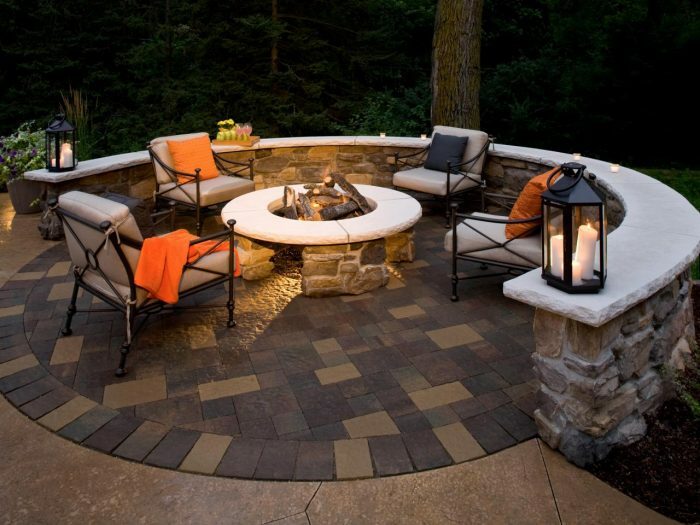 Feel free to go for a simple wood-burning pit or a more expensive stone design fire pit. Metal art – If you are looking for an addition that looks good with or without fire, you can try these metal art pieces. Their angular geometric shape is just chic. They are also available in a carbon steel with a rust patina. Tabletop fire pot – These fire pots are more of a short-term solution and we advise you use them when hosting guests. They are ceramic bowls fuelled by an isopropyl alcohol solution. Expect the flame to burn for about 3 hours. Moveable lighting is one of the better accessories. You don’t have to worry about burglars or weather elements. One lighting accessory you can consider is the oversize floor lamp. 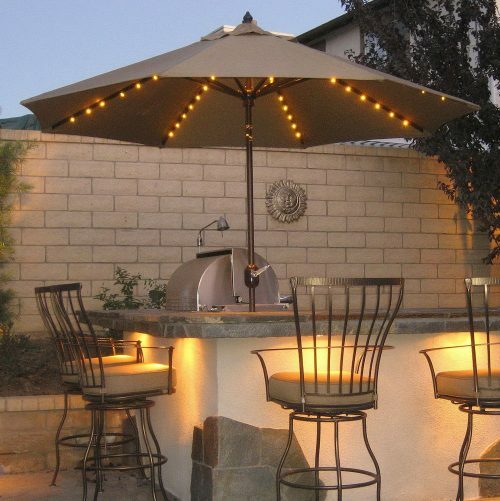 It is specially designed for outdoor use and can light up an entire patio. To protect it from weather elements, it has a plastic shade, an aluminum support, and lead weights to protect it in windy conditions. 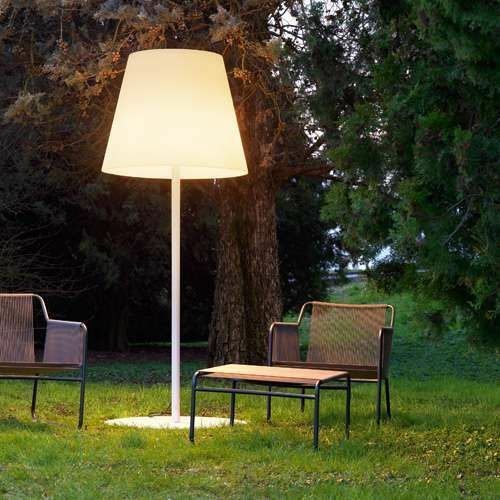 However, you will need a weatherproof outdoor outlet as the lamp is a plugin. You can also choose the lamp post patio lighting. You don’t have to be concerned with digging an electrical or gas line. Or you have to do is plug it in and place it wherever you feel. However, this means you need a weatherproof outdoor outlet. It is the perfect lighting fixture to create a Victorian or Cape Cod look. 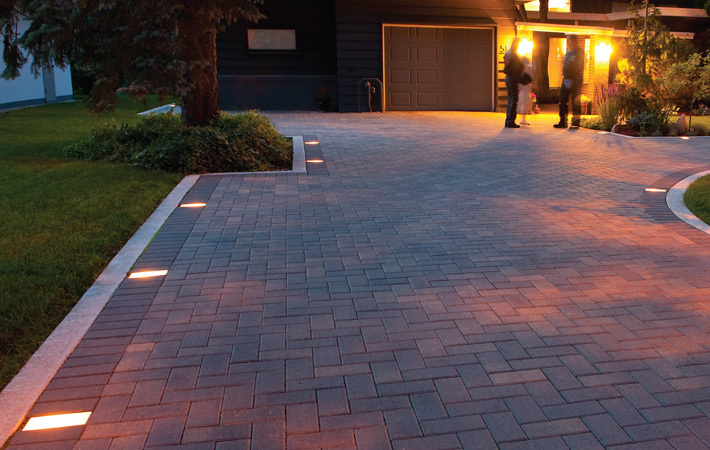 You don’t have to break the bank with patio lights. Also, they don’t have to be over the top. Simple and easy can do. One such light is this battery operated outdoor lamps. You can count on them to give you well over 150 hours of LED light should you lose electricity. Also, they are weather resistant and can be used when the weather is less desirable. Finally, the resin wicker base is a classy addition as it resembles real wicker. The idea behind the Mini Pili lights was that they should not only light up your patio but also look good during the day and at night. They achieve this with the materials being sympathetic to the scheme as well. Also, they are designed to be minimalistic. These fixtures are plant-like and you can wound them between shrubs. For a modern patio/garden, we advise you purchase the stainless steel works. The copper and bronze fixtures will work better in naturalistic settings. If you are looking for an expensive effect or just a soft glow, you can invest in some candle or torches. Candles will provide a soft glow and you can place them side by side for a more dramatic outcome. If you have kids and pets, you run the risk of burning down your home as they can easily knock the candles over. We advise you use LED flameless candles that provide the same effect but with no risk involved. The torches will provide the expensive look, but be careful as they can be knocked over. Volare HK – This could probably be the best light a homeowner can find. If you are looking for fixtures that are versatile, easy to install (no tools required), and will not burden you with bulky wires, we advise you get the Volare HK umbrella lights. These attach to umbrella poles of diameter 35mm to 43 mm with the help of plastic clamps. Hangers are also included if you want to hang it. The light has 28 lights (4 larger LEDs and 24 smaller lights), with three modes of operation. You can light up just the 4 larger lights, the 24 smaller lights, or all 28. Also, you can attach the fixture high or low depending on your preference. Finally, it is battery powered thus you don’t have to worry about outdoor power outlets and wires. Solar powered LED Umbrella – These are umbrellas that are fitted with LED lights and a solar panel. They are the best for homeowners who want to avoid the hassle of setting up the lights. The solar panel connects to the top of the umbrella harnessing the sunlight. You don’t have to worry about obstacles blocking the sunlight as you can easily tilt the umbrella. It is also fitted with a crank feature and thus you can lower or raise it. Expect the light to last for 4 hours minimum, which is enough for a conversation or to read a book. It is very easy to make your patio, deck or garden into something to be envied. All you need are a few low voltage or solar lights strategically placed. If you can afford to have mains voltage outdoor lighting installed by a professional then the effect will be even better. DIY kits are available for low voltage lights and solar powered lights from your local home décor store or garden center and require just a few basic tools to install. Above all use your imagination when designing your layout.